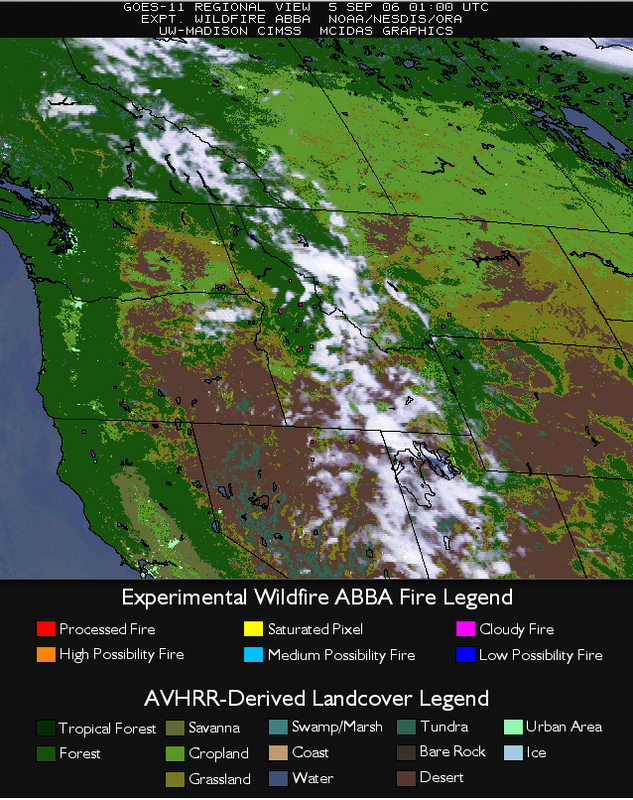 Wildfire activity persisted across parts of the Northwest US today, with GOES-11 Wildfire ABBA indicating a number of active fires in WA, ID, and MT (below, left). The smoke from these fires became rather thick from eastern Washington to western Montana, as seen by the widespread haziness in the MODIS true color imagery (below, right). Not surprisingly, the IDEA products portrayed very high MODIS aerosol optical depth (AOD) values over that region, and the smoke was having an impact on surface air quality across portions of the Pacific Northwest. Subtropical moisture associated with weakening Hurricane John began to spread northward into the desert southwest, which was well depicted on AWIPS imagery of the GOES sounder total precipitable water (PW) derived product (below, left). 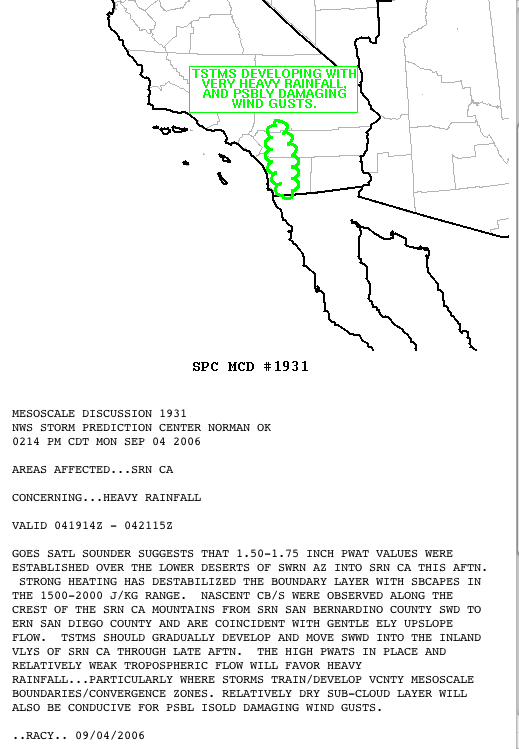 This surge of moisture (QuickTime animation) prompted the Storm Prediction Center (SPC) to issue a Mesoscale Convective Discussion concerning heavy rainfall over the lower deserts of southern California and Arizona (below, right). GOES sounder and MODIS PW values compared favorably well, and at one point (08 UTC) the GOES sounder PW derived product indicated an isolated value of 61 mm (2.4 inches) over Arizona. Surface dew point temperatures reached the 60s and 70s F at some sites in the lower deserts, and rainfall from thunderstorms that subseqently developed was responsible for some flash flooding in parts of California and Arizona.